A look back on one of Nintendo's most controversial decisions. “The Legend of Zelda: The Wind Waker” remains one of the most unfairly pre-judged video games of all time. When the first footage of the then-unnamed cel-shaded Zelda game was revealed at Nintendo’s Spaceworld event in 2001 it was met with disappointment and explosive outrage, and the game was mockingly called “Celda” by disgruntled fans. I first saw “Celda” in the November 2001 issue of Electronic Gaming Monthly. When I saw the screenshots I was immediately excited and impressed. I felt the cartoon visuals were a perfect fusion of the artwork from the original “Legend of Zelda” with the gameplay elements pioneered in the Nintendo 64 game “The Legend of Zelda: Ocarina of Time”. 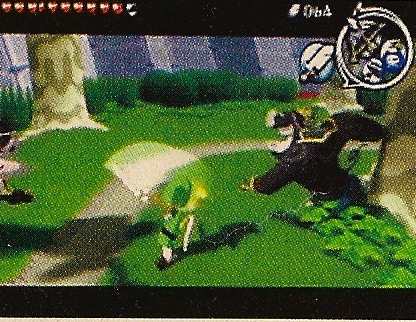 There was a tech demo of a realistic adult Link fighting Ganondorf shown a year before at Spaceworld 2000. This tech demo was made to be a demonstration of the Nintendo Gamecube’s abilities, but was not in itself a complete concept for a game. Taking notice of the dark color scheme seen in the trailer (darker in fact that the final version of the game), I could see how this Zelda would be able to take itself seriously in the same way the Super NES game “The Legend of Zelda: A Link to the Past” did despite it’s cartoony visuals and concepts. In “A Link to the Past”, Link was a child who had pink hair, enemies would do a Loony Tunes style “walking over air” take when knocked into holes, and in one section of the game Link is transformed into a pink bunny. The bright bold colors and the shading on the trees and shrubs seen in the “Celda” trailer harkened back to “A Link to the Past”, as did the soundtrack, which adapted musical themes from that game. Even Link’s brown sleeved garb was a throwback to the original NES artwork. 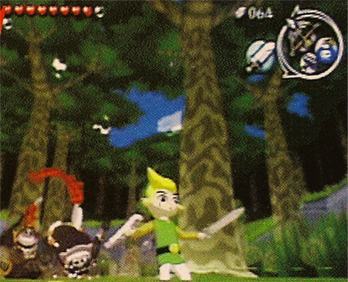 While the visuals were massively overhauled, the gameplay seen in the trailer was very similar to what was seen the first 3-D Zelda, “Ocarina of Time” and it’s follow up “The Legend of Zelda: Majora’s Mask”, but with new additions like stealth sequences and timed parry attacks for use in battle. In Electronic Gaming Monthly the editors had a debate on the new art direction, some defending it and others claiming it was “just not Zelda”. It was a month or two after seeing the first “Celda” screenshots that I was able to access the internet, and I was pretty shocked by the vehement outrage that had erupted in the online gaming community, where the response to the new Zelda appeared to be overwhelmingly negative. In hundreds of message boards posts and emails to Legend of Zelda fansites, players damned Nintendo and pledged to boycott Gamecube entirely, claiming that Nintendo had abandoned them by making a Zelda game that catered only to small children. 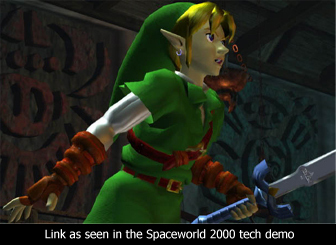 Judging by the reactions I read, a lot of people felt betrayed because they expected Gamecube’s premier Zelda game to look like the tech demo shown at Spaceworld 2000 which featured an realistic, adult Link, when Nintendo themselves said that the demos were not necessarily indicative of retail software. Zelda was never a “mature” franchise. Out of the eight Zelda games then available, “Ocarina of Time” was the only one to depict Link as an adult. It’s like their disappointment in the “kiddie” cel-shaded Zelda somehow warped them into remembering the E rated “Ocarina of Time” as a mature game. And the ironic thing is, I would bet that a lot of the people on the internet insisting that “we aren’t kids anymore Nintendo give us mature Zelda” were probably between 13 and 15 years old and hadn’t played a Zelda game before “Ocarina of Time”. I say this because it seems to me that only someone who knew about Zelda solely from playing the then very recent “Ocarina of Time” would think “Celda” was breaking precedent by starring a child Link in a cartoony setting. Some argued that “A Link to the Past” only looked cartoony because that was all the Super NES could handle, but “Final Fantasy V”, “Super Metroid” and “Castlevania IV”, were all very realistic games released for the Super NES, the visuals of “A Link to the Past” were not an accident or the result of technical limitation. The uproar even struck long running and highly respected Zelda fansites like Odyssey of Hyrule, where the webmaster, Video Gamer X, known for his passion and knowledge of the Zelda series seemingly took one look at the screenshots and dismissed the game entirely, accusing it of being a FMV cartoon like "Dragon’s Lair" rather than a full fledged game, and even compared it to the infamously atrocious CDI game “Link: Faces of Evil”, the result of a mid 90’s licensing deal that allowed Phillips to produce their own laughably bad Zelda and Mario titles. Video Gamer X’s reaction was baffling in that for someone seemingly as technically proficient as him, he seemed to know nothing about what he was talking about when it came time to rant about “Celda”, referring to cel-shading as being “2-D” and “sprite based”, neither of which are true. The best surviving example of the climate of hostility toward the first “Celda” screenshots is Video Gamer X’s website, Odyssey of Hyrule, which was one of the most popular and respected Zelda sites of the 90’s. Most of the comments in his mailbag page dedicated to “Celda” reactions were over the top negative, with a very few cautious “Lets wait and see”s and even fewer positive responses. 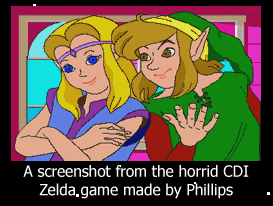 Some of the comments even complained about the then recent “Oracle” Zelda games for GameBoy Color, with comments like “First Nintendo give us the kiddie Oracle games on Gameboy and now this kiddie cel shaded crap on Gamecube”. No seasoned Zelda player would have claimed that “Oracle of Ages” and “Oracle of Seasons” were “kiddie” Zelda games. If they had played a single Zelda game prior to “Ocarina of Time” they would have known that the graphics and artwork used in the Oracle games were very similar to those used in “A Link to the Past” and “The Legend of Zelda: Links Awakening”, the two Zelda games that proceeded “Ocarina of Time”. - Some of the younger kids who played “Ocarina of Time” as their first Zelda game were now entering that terminally hip early teen phase of wanting to be seen as “mature” by their peers. - Young adults who grew up with Zelda since the NES and Super NES days and were now into T and M rated games with realistic graphics had unrealistic expectations of Zelda becoming “mature” in order to suit their tastes. 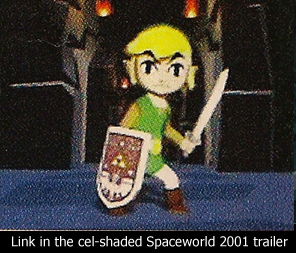 - The Spaceworld 2000 tech demo was taken as a “promise” from Nintendo as to what the next Zelda would look like, and felt they had been lied to or deceived when “Celda” was revealed. Nintendo was flooded with angry emails, it got so bad that Nintendo’s prepared response to all Zelda related inquiries began, “I'm sorry to hear of your outrage towards the new Zelda...”. The hurt felt by gamers offended by the look of “Celda” was amplified by a fake Shigeru Miyamoto interview which claimed that Miyamoto adopted the new look because a realistic game would be too violent and scare small children away from playing Zelda. Another rumor claimed the story for the then unnamed Zelda involved Link traveling into the underworld to save Princess Zelda, which proved to be without merit, though a later Zelda game, “The Legend of Zelda: Twilight Princess” by coincidence had a very similar premise. During the transition form the 5th to the 6th generation of game consoles, many developers placed emphasis on enhancing realism and striving for visuals indistinguishable from real life, and applying that to games designed to appeal to players over the age of 17. Because of this, Nintendo’s decision to utilize their next generation hardware to create a more vivid, cartoon-like expression for Zelda was falsely perceived as a step backwards. 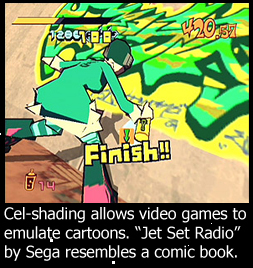 Less knowledgeable gamers accused Nintendo of “taking the easy way out” by making "The Wind Waker" cartoon-like, assuming that realistic graphics take more effort and that Nintendo was being lazy by using cel-shading. The falsehood that good graphics mean realistic graphics is nothing new of course, reviews in major gaming publications accused the Super NES’s “EarthBound” of having NES quality graphics and looking childish, despite the game showing vast graphical improvements over it’s NES predecessor, “MOTHER”. The first impression of “Celda” lead a number of gamers to think that Gamecube was an underpowered system and that the Spaceworld 2000 Zelda demo had to be “downgraded” into something the Gamecube could handle. It also helped perpetuate an attitude that Nintendo Gamecube was a “kids only” system with childish games lacking in depth and challenge. 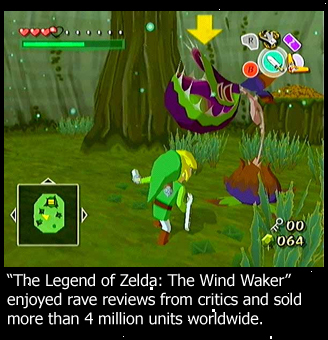 This reputation haunted Nintendo Gamecube throughout the 6th Generation Era and contributed to the poor marketshare of Gamecube despite the system playing host to many best selling titles including “Legend of Zelda: The Wind Waker”. 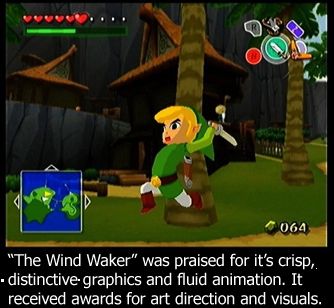 For a game that arguably ruined Gamecube’s reputation before the system even launched, “The Legend of Zelda: The Wind Waker” was met with excellent reviews in gaming publications when it reached North America in 2003. Even gamers who at first scoffed at the cel-shaded visuals hailed “The Wind Waker” as one of the best Zelda games ever made and one of the best games of the 6th Generation Era. “Twilight Princess” proved that Nintendo was not afraid of scaring away kids with a realistic Zelda, and that Gamecube was more than capable of realistic visuals. 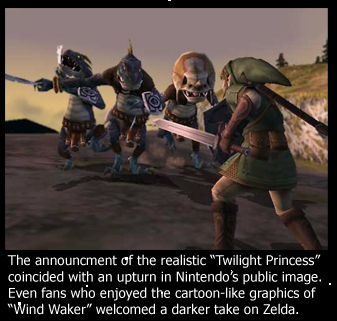 The announcement of “Twilight Princess” was viewed as the turning point in Nintendo’s public relations in which they shed the lackluster public image they had carried since the launch of Gamecube. Though developed as a Gamecube game, “Twilight Princess” debuted in November 2006 as a launch title for Nintendo’s phenomenally successful Wii console, employing motion controls and infrared pointing to wield Link's weapons. A Gamecube version was quietly released several weeks later with traditional controls. 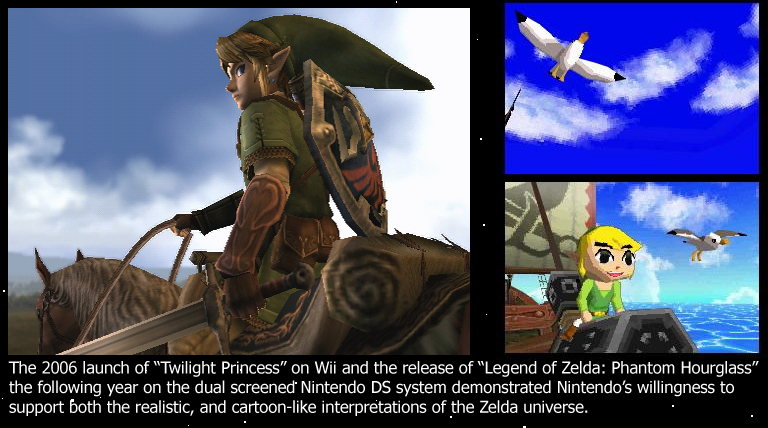 Interestingly, “Twilight Princess” was the first game in the Legend of Zelda franchise to exclusively star an adult Link. In “Ocarina of Time”, Adult and Child Link shared the limelight, as Link begins "Ocarina of Time" as a child and completes the adventure as an adult, with a time travel feature allowing the player to switch between time periods at will. Since Gamecube’s “Wind Waker”, the cel-shaded interpretation of the Zelda universe has appeared only on Nintendo’s handheld systems. 2005’s “The Legend of Zelda: The Minish Cap” translated the visuals of “Wind Waker” into a 2-D world on the GameBoy Advance reminiscent of “A Link to the Past”. In 2007, a direct sequel to “Wind Waker”, called “The Legend of Zelda: Phantom Hourglass” was released on the Nintendo DS. “Phantom Hourglass” was the first portable Zelda rendered in 3-D, though much of the gameplay took place from a top down perspective similar to previous GameBoy and Super NES adventures. 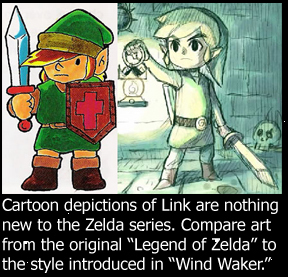 When Nintendo announced “The Legend of Zelda: Spirit Tracks” for the Nintendo DS in 2009, once again adopting the cel-shaded visuals of “Wind Waker”, some comments to the trailer on sites like YouTube moaned at the notion of another cel-shaded Zelda and demanded a “real Zelda” featuring an adult Link on Wii, though many more comments were very enthusiastic. Though by now most Zelda players have accepted both the realistic, and cartoon-like interpretations of Zelda as being equally legitimate, the debate remains a divisive issue in the online community of Zelda fanatics.